Txt 0920-901-0863 or email ticket2me(at)gmail(dot)com for ticket inquiries/reservations. Go to http://ticket2me.blogspot.com/2007/09/childrens-letters-to-god-preview.html for a sneak peek. "Dear God. Are you really invisible or is that just a trick?" "Dear God. How come you did all the miracles in the old days and you don't do any now?" These are just some of the hard-hitting questions and tell-it-like-it-is revelations that make up CHILDREN'S LETTERS TO GOD, the new musical inspired by the international best-selling book of the same title. This entertaining show carries a universal message, which crosses the boundaries of age, geography, and religion. 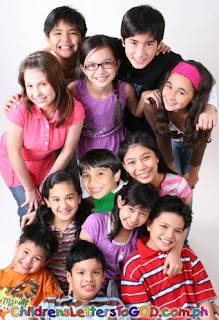 Expressed in letters recited by five talented young actors (ranging from 9 -14 yrs.) that are both amusing and heartfelt, they ask questions like "God , how did you know you were God?" and "God, why do my feet stink?" Directed by Director Bart Guingona, Assistant Director Menchu Lauchengco-Yulo, Musical Director Michael Williams and Choreographer Denisa Reyes.